Aqua Soleil Villa 24 is Ideal for your family holiday, this three bedroom apartment has views over the Mercury Bay, is fully self contained with all linen and towels provided. Come and enjoy for your next holiday in Mercury Bay, the unspoilt playground of paradise. 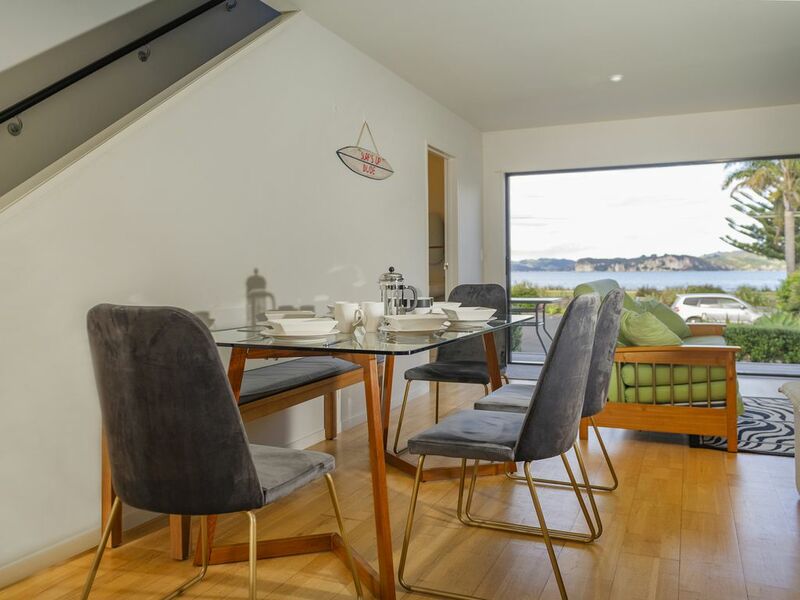 The apartment has two levels, on the lower level there is an open plan kitchen, dining and living area with a full width ranch slider onto the deck and views of the bay and township. There is outdoor seating for your use. The modern kitchen is well equipped with fridge and freezer, dishwasher, oven, stove and grill, microwave, kettle and toaster, utensils, cutlery and crockery. The lounge has seating for enjoying the view or watching freeview television and there is a dining table. Also on this level is the third bedroom with a double bed. Off the lounge is a toilet with hand basin. The master bedroom is upstairs with a ranch slider opening up to a full deck along with the twin bedroom with views over the pool and spa. Also upstairs is the bathroom with toilet, vanity and shower. Aqua Soleil Complex has a lap pool and spa available for your use and is located directly across the road from Brophys beach which is ideal for swimming, walking and exploring the seashore and has beach access for launching trailered vessels. Whitianga township with its shops, supermarket, cafes and restaurants is only a 5 minute drive away or a leisurely 40 minute walk along the beachfront. Enjoy a soak in the hot pools at The Lost Spring, or from the wharf take a ferry ride to Ferry Landing and explore the nearby beaches and bush walks or embark on a scenic cruise of the local area from one of the many local tour operators. Whitianga is an ideal location for exploring the local gems that the area has to offer; walking into Cathedral Cove, adventure activities at High Zone or Combat Zone, diving the local waters, soaking in a hot pool at low tide at Hot Water Beach, fishing and many more. Come and enjoy. Self catering apartment with sea views, all linen and towels provided - your home away from home. Yes, the location and outlook is great but the description is not completely honest.There is only one bathroom and a separate toilet, not 2 bathrooms and we were 2 couples looking for 2 bathrooms. There is not any SkyTV as advertised. There is an antiquated TV with some receiver box giving the free to air channels and rather poor reception. As per a previous comment on this unit a good clean, particularly around walls and skirting boards would be a good idea. With a glass table top would suggest place mats would be a useful addition. Nice property and location, the pool is great. We were not 100 percent impressed with the cleaning - the cutlery and dishes were dirty (dishwasher issue?) and the the sofa needs a good clean. But a nice quiet unit, lovely view, and we had a wonderful time. Absolutely gorgeous accommodation; view across the bay and pool and hot tub in the grounds. Felt very lucky to be there. The property was nice overall. The property was nice overall. Very spacious and worked well with five people staying. It was quiet and peaceful, and we did enjoy the facilites. The only downside was that we would have liked to have enjoyed the spa earlier than its opening time of 5.00pm. Really lovely space. Wonderful view straight out to the water. Clean, tidy and very comfortable. Nice property with all the mod cons - had a few issues with the tv reception but wasn’t a big deal.